Race 2 of the Professional Cross Country Club of Tasmania’s season was held on Saturday – the only Saturday race for the season. Starting and finishing at the Cooee Hall, the course circumnavigated Burnie High School before heading towards the Durham Road hill, climbing five hundred metres to the turn. Hot, steamy conditions made for a tough run for the sixty-two starters. Cooee runner, Josh Febey, was not deterred however, digging deep to take the win by just five seconds from Wayne Wiseman. Aaron Robertson again showed good early season form finishing third. Dale Lancaster lead the field away but Ron Chequer and Mary-Lou Troughton soon had her in their sights and took up the running. Sven Mason and Kelly Baxter looked chances for a time as did backmarkers Jason Fehlberg and Ben Saint-John who started to pick their way through the field. With less than a kilometre to run Febey had hit the lead and was able to hang on for a well-deserved win. It was his second with the club, the first being in 2015. 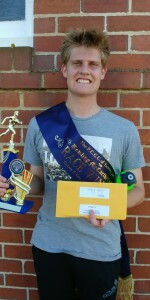 He credited the win to training with the Salty’s Striders running group, in Burnie. This had not only improved his fitness but given him increased motivation. Saint-John took out fastest time for the men with Rebecca O’Garey fastest female. Earlier the nominated time winners were Mia Fehlberg, Mackenzie Troughton and Brian Paine. I swear I saw a few Devonport runner’s in this weeks race running from Devonport to Cooee. This might be a sign of having more juice in the tank come August. Well done Josh on your win.